Baked or grilled fish has always been a favorite way to have fish but I always love my fish on bone and with skin. I feel there is just no taste when the fish is cooked without the skin and bone. Nutrition wise too, you don't get much from a fish when you remove the skin, most of the omg3 is found in the skin and bones release some calcium when cooked in curries. Although fish is seen as a potential source of chemical contaminants like mercury, we have little choice even with vegetables. Anyways, I cook fish fillet for guests as I don't want them to struggle with fish bones on the table. Fish pieces in soups or light curries is loved more by some and grilled or baked fish is liked by some others. I baked this fish for a potluck we Delhi bloggers had at Deeba's place a couple of week's ago. It was liked by all of us. So much so that it vanished quickly and I felt terrible for not having baked more amount. The recipe was requested and I promised to upload on the blog. And to tell you the truth, it is a simple recipe, but needs precision while baking. I say so because I have burnt my hands with this. A little bit of delay and the fish gets scalded and dry textured. I baked it once for my brother and sat with him doing some chitchat while the fish was in the oven. A little miscalculation of time and the fish got dry, though it didn't look burnt. The real pleasure of this fish is when it is baked just till the surface starts getting firm and dry. Read on. The real taste maker in this fish recipe is this butter-lemon-herb mix. 100 gm of butter cut into cubes, 50 ml extra virgin olive oil, 2 tbsp of finely chopped garlic, 1 tsp lemon zest, some rosemary and a lot of chopped parsley. Mix everything together and keep in a warm place till the butter gets soft. Then give it a good stir and let it rest for about 2 hours. This butter mix keeps well in the fridge for about a week. The fish (I used a kilo of Basa fillet, each fillet about 350 gm) is rubbed with salt and pepper and kept aside for just 10-15 minutes. Grease a shallow baking tray that can accommodate all the fish fillet. Arrange the fish on it, preheat the oven at 180 C, sprinkle freshly milled pepper on top of the fish fillet and slip the baking tray inside the oven. Middle rack preferably. It will take about 25-30 minutes but be watchful. after about ten minutes in the oven, the fillet releases a lot of water and looks like floating in water again. Let the water be soaked into the cooking fish again, it will be done in the next 10 minutes or so. The fish will be cooked as soon as a the water is reabsorbed, how ever time it takes. Take out the tray and smear the fish liberally with the parsley-garlic butter mix. Slip back the tray into the oven and wait for a couple of minutes or till the surface of the fish starts bubbling with the added butter mix. 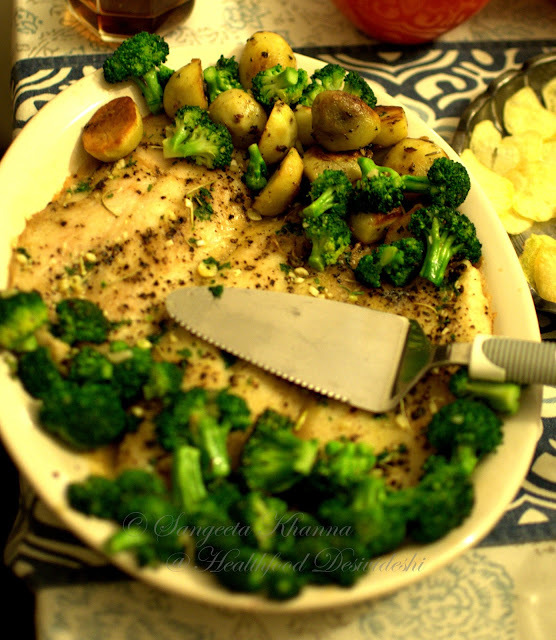 Take out the tray immediately and serve hot, sauteed Broccoli and baby potatoes arranged on the sides. 500 gm both potatoes and broccoli florets were used. Parboil the potatoes in salted water, preferably with skin (nicely scrubbed clean), but peel off the skin if it is not too clean. Keep aside. Blanch the broccoli florets in the same salted water in which the potatoes were parboiled, quickly transfer them to ice cold water to retain the crunch and the colour. Strain and keep aside till required. As soon as the fish is getting ready, saute the potatoes first with about 1 tbsp butter mix and then the broccoli with as much butter. Drain and arrange on the sides of the fish platter. This is one of those recipes which will help you making a meal memorable, gatherings warmer and laughter more abundant. 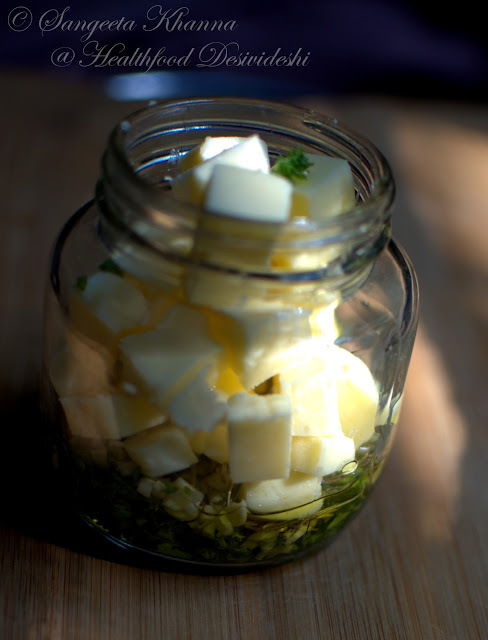 You can always bake chicken too in this butter mix, or paneer or tofu if you are a vegetarian, but fish absorbs this butter-lemon-herb mix like a parched soul and gets drunk on taste. 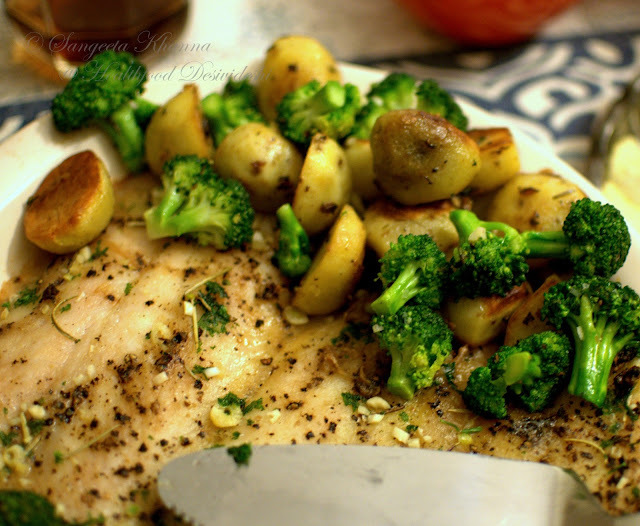 When are you trying this baked fish? I can literally feel the aroma of the fish .Super. Thank you for posting this. I feel a lot more fish confident now, and we were fortunate to taste this deliciousness, and get drunk on it! Vineet has not stopped singing praises of this bake. Was the rosemary fresh? No luck with fresh rosemary, this lot was bought from an organic farmer at Dilli haat and turned out to be the best rosemary I have ever had. Thank you so much for being our host that day and for all your generous praise as well.